I really enjoyed this visualisation of a topic map of science, especially the apparent links between Computer Science and Social Science – so much so I ordered a print, and framed it. So what is this … well it’s a map that shows the 800k papers that were most highly co-cited by papers published in 2003. 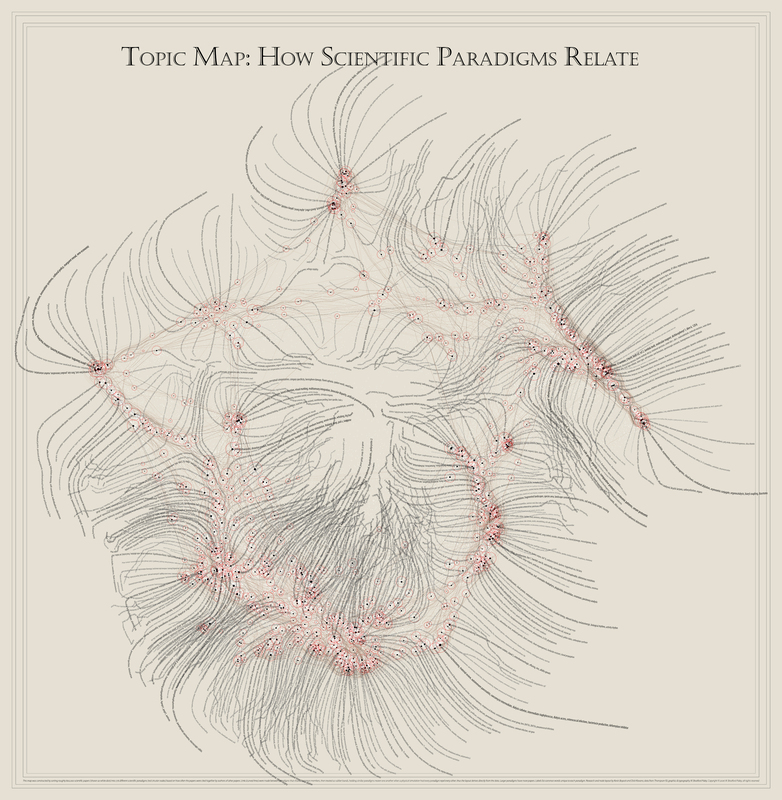 In the paradigm map the clusters are the reference points in science upon which current science is being built. I’ve read from the authors that “Maths” is not as prominent as might be expected because the culture in math is different than the culture in other sciences in that math papers have far fewer references, thus lower co-citation rates and is also spread throughout the CS and engineering regions, especially where algorithms are used to solve engineering problems. While I understand and quickly see that the map is hard to read, there are too many overlaps & text paths that bump over each other and that certain paths are too choppy, this has to be taken as an “art/science” illustrations, a tool that evokes interest in the area more so than helping to explain the phenomena that are supposed to be the science subjects. 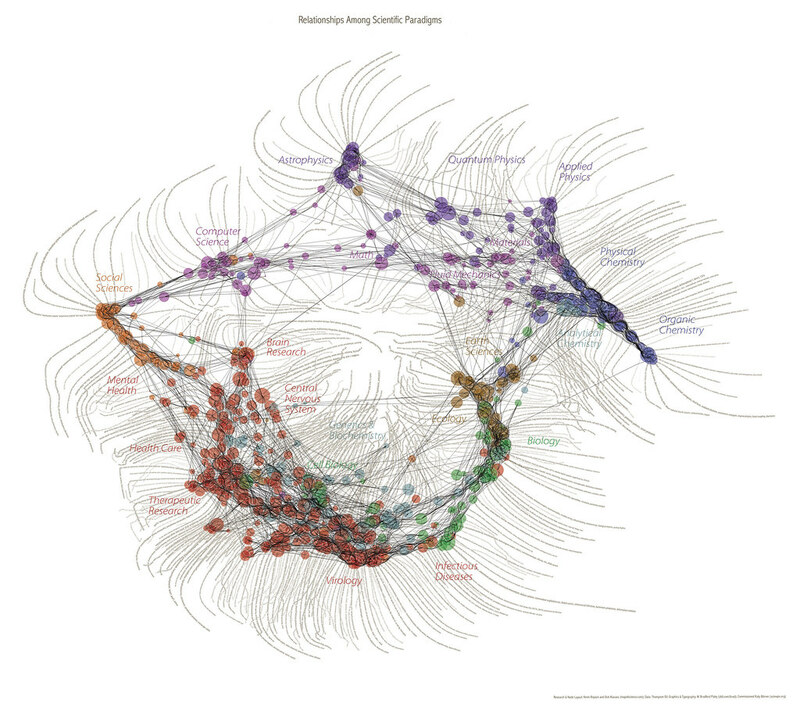 Related to this topic but not related with the orginal authors is this piece on the 6 Degrees of Computer Science. The connections to Software Engineering, Computer Engineering, Electrical Engineering, Mechatronics Engineering and Math / Physics, I think are well thought out. Completed in March 2007, this report analyses the feasibility of the European Institute of Technology [EIT] (pdf) as proposed by the European Commission and positions it in the context of existing universities, research establishments and institutions and programmes for supporting innovation and technology transfer in Europe. same for all countries, all regions or all institutions … and that smaller European countries, Finland, France, Spain and Germany perform significantly better than or as good as the US and Japan. 2) Three basic organizational models exist for an EIT. A fully centralized EIT on one location is the first. The Commission proposal opts for the fully decentralized one where research, training and supporting innovation in one Knowledge and Innovation Community (KIC) is carried out by a large number of teams across Europe. The report proposes a third option, a cluster model for the EIT. This option consists of multiple institutes or KICs – to derive the terminology of the Commission’s proposal – but each being physically concentrated at one or only a very small number of adjacent locations. The various institutes are knot together only by a funding instrument and a brand name. 3) Knowledge production is ‘joint production’: private and public investments in knowledge have strong complementarities and geographically strong agglomeration features.Under the prevailing conditions, the cluster model has the greatest potential to strengthen the main local/regional agglomeration aspects of joint knowledge production within the research areas turning them into attractor poles for knowledge workers. 4) Europe’s score in university rankings shows that EU universities are underrepresented in the top 40 or 50 ranked universities. Source: The Shanghai JiaotongUniversity ranking 2006. And for my own reference the Ranking Methodology used. While Europe has several top tier universities of high quality offering excellence over a broad range of subjects. Where they differ from US equivalents is in their selectivity of admission, share of undergraduate and graduate students (apart from a few exceptions such as ETH Z), size of research budgets, and to a lesser extent, in their level of interdisciplinarity which might be related to the much narrower bachelor curricula in Europe. it is clear that over the past 15 years, many universities have been actively engaged in projects to collaborate with industry and commercialise the knowledge that they developed. 6) Several large-scale co-operative schemes exist at the European level which companies, universities and research centres find attractive and effective for joint technology development underpinning future innovation, such as the EUREKA Clusters, FP6 Integrated Projects FP7 Joint Technology Initiatives, and National Programmes such as those in the UK, Germany, Sweden, Finland, Spain, Belgium, and France. 7) Impact: The report points out that there may be significant substitution problems. In several important fields where a KIC would most likely be considered, instruments already exist or are under construction to promote collaborative research, technology development and technology transfer. EUREKA clusters are a case in point, where partners may not see the advantage of being replaced by a KIC. The Joint Technology Initiatives currently being formed under the FP7 would also appear to compete with any potential KIC given the fact that the differences between these two entities are not clear enough. It notes, but do not simply adhere to the views expressed by some companies that a KIC will complement rather than compete with such initiatives. The limited impact that a KIC, hence the EIT, would have on the quality of graduate training, research and, industry-university-research institute collaboration, coupled with the substitution effects, suggests that the EIT through its KICs cannot easily develop into a reference for the existing top tier universities or research institutes in Europe. Its dispersed nature would not assist the universities and national governments in their quest for reforms leading to for example, increased differentiation, autonomy and better governance, or for more effective technology transfer practices. Given these points this is not what I read from the headline of a recent IEEE Spectrum article “U.N. EXPERTS DISMISS VIRTUAL EUROPEAN “MIT”“. The EU FP7 ICT : Cooperation : Call 2 opened yesterday. Of most interest to me will be the New paradigms and experimental facilities ” with it looking at advanced networking approaches to the Future Internet coupled with their validation in large scale testing environments and the interconnected test beds. EU FP7 Call 1 proposals are being evaluated this week (June 4th -8th, so even with all those pent up nerves, it’s still time to look forward to Call 2 and the FIRE Initiative. With the help of Jim C. we should get some feedback on the Objective ICT-2007.1.6 : New Paradigms and Experimental Facilities Information day on 14 June 2007 [pdf]. IPv6 is quietly fading away as a topic according to the IETF. Wait, wait please read on, the article expresses “this is a good sign for IPv6, and it shows that the closing of the IPv6 working group was a sensible move and that IPv6 is becoming mature” …. “becoming an integrated part of all of the work within the IETF” … “The fact that the focus for IPv6 is on operational issues and integrated IPv4 and IPv6 issues shows that IPv6 has moved into a new phase and is now starting to become a natural part of the daily life of the IETF and the network community as a whole”. IPv6 For the Rest of Us, does show a slightly different view point highlighting that “there is no demand” for IPv6 right now … but with the advisory issued by ARIN to alert the internet community of “that migration to IPv6 is necessary for any applications that require ongoing availability from ARIN” this demand may change! And not all is rosie with IPv6, as reported on a number of tech news sites, the elimination of the RH0 header problem which exposes a potential security flaw in IPv6 was front in centre recently. The initiating presentation on the topic [PDF] is quite interesting. In more controlled testing there was a recent DHCPv6 Bake Off (March 2007) which appears to have gone very well. As is the purpose of these things a number of issues were identified, with a key question of “What should happen when a client requests a particular address and the server does not agree to the request?” sounding like another big DoS problem, as articluated by John R.
Some interesting ENUM news has hit the streets …. well a low key hit anyway that ENUM is now a service being offered in Ireland. So everyone with +353 phone numbers, which should be everyone in Ireland both landline, mobile and VoIP can avail of this …. this … well I’m not quite sure what! I have to investigate this one myself! As to a general explanation well the ENUM wikipedia entry is always worth a quick glance. From what I can see ENUM is a proposed international public database (DNS) that links telephone numbers to Internet names and other Internet related destinations and identities. Any party can now interrogate the DNS system with the telephone number of an ENUM subscriber and DNS will return a list of identities and Internet related destinations that are associated with that subscriber; for example their email address, SIP address or web page, thus bridging the old world with new. So now the ENUM service should be crystal clear …… well no. Let’s look to the Irish specific case, what this news story is saying is that the Tier 1 registry for Ireland has been launched, and in effect the 3.5.3.e164.arpa top level zone in DNS is being managed by IENUM Ltd which will provide and maintain the Irish internet community with the necessary infrastructure for ENUM domains within the +353 country code. This is under contract from the Irish telecommunications regulator – ComReg. So now for my +353 telephone number I can set a list of associated identities such as my email address, SIP address and web page against it! How much does it Cost? Okay it’s set at 1 euro a month, but there’s a little sting in the tail . There’s a repeated validation (“revalidation”) every 6 months, which you as a customer is charged for …. hmm that’s a little checkie! 1) How will people know I’m an ENUM subscriber! 2) Spammers gaining access to all my contact details! The UK folks held a workshop in January 2007 and there’s some good material there. And the impact of all of this?